Slatter, Angela “Bearskin,” The Dark #7. Slatter, Angela “Lavinia’s Wood,” She Walks in Shadows. Slatter, Angela “Ripper,” (novella) Horrorology. And I’m equally delighted to see so many friends on the list too! Lisa L. Hannett, Aaron Sterns, Robert Shearman, Damien Angelica Walters (whose “Sing Me Your Scars” still gives me chills), Molly Tanzer and loads more! 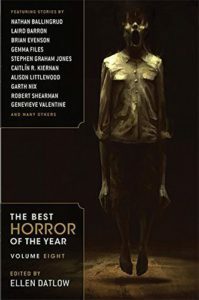 This entry was posted in News and tagged Aaron Sterns, angela slatter, Damien Angelica Walters, ellen datlow, Lisa L Hannett, lisa tuttle, robert shearman, simon kurt unsworth, The Year's Best Horror 9. Bookmark the permalink.